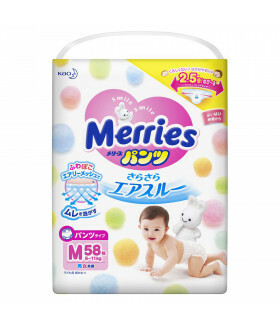 Merries Pull Up Pants are the super premium Japanese diaper that customers rave about. These thin, comfortable pants are so absorbent and prevent leaks, but they are also made to reduce diaper rash and itching. Even better, they are organic. Even though they are hard to find in stores in the USA, they are available to buy online. It is important to have a diaper or pull up that keeps a baby’s skin dry and soft, not irritated or itchy. One way that Merries Pull Ups do this is by creating a breathable layer between the diaper and the baby’s skin. The soft surface that touches the baby doesn’t stick so that air can pass through. The breathable layer between baby and the diaper keeps the baby feeling comfortable even if they pee a lot. The absorbent layer does not expand between the baby’s legs because the whole surface of the pant is used. Channels and pits draw away the pee and poop as well. The entire pull up is breathable.All pull ups are also treated with witch hazel, a natural anti-microbial and anti-inflammatory. Another point of irritation on a diaper is the waistline. Since babies will sweat, Merries has a breathable diaper “gum” that keeps the pull up snug to the body yet allows air to pass. This prevents redness around the body but allows movement, especially when the baby starts to roll, crawl, and even walk. No matter what, it fits the tummy perfectly. Merries training pants are made of soft cotton, polyolefin, non-woven polyester, cotton linters, paper, super absorbent polymer, polyolefin film, non-woven polypropylene, polyurethane, and hot melt. The polymers used in Merries pants absorb a lot of wetness. It can absorb 200-300 times its own weight. The indicator shows if the pull up is wet by changing colors to blue. Merries Pull Ups are available in the USA through our online shop. You will find them and other great baby products at low prices. We deliver fast and provide great service when you need us. Check out our discounts and promotions when you shop for Merries Pull Ups.